Hi guys! thanks for visiting our website, today we are going to share with you a very helpful and very useful Tool which known as GSM Flasher FRP. plz concentrate here GSM Flasher FRP is not Free it is paid software you can't get without paying. are you know about GSM Flasher FRP Free Version, its aversion is completely free. Today we have arranged here its free version for your all Samsung, Huawei, Motorola, HTC and Qmobile etc for absolutely free you can download for any kind of mobile phone. 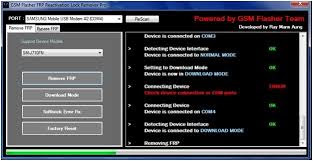 now if you want to know about downloading and installing of GSM Flasher FRP Crack then just follow below given instructions! we have placed the original, direct and safe links at the bottom of this page, don't care about the viruses and threats etc just click on the links and automatically start downloading. if the download links don't work properly or you are facing any other difficulties during downloading or installation process feel free to ask us any question or tell us your problem through comments from below given box.